The DeHavilland Caribou entered service with the United States Army in the early 1960s, as the service was in the process of developing a new emphasis on aviation. A decade and a half earlier the creation of the United States Air Force left the Army without transports of its own as the Law of the Land assigned all air assets previously owned by the Army to the new Air Force. But in the early 1960s the Army was trying to get around the restriction by building a new aviation capability centering around helicopters and fixed-wing airplanes of low gross weight. In 1962 an Army panel known as the Howze Board after its chairman recommended that the Army embrace a new concept known as "air mobility." Following the recommendation of the panel, the Army made plans to purchase 250 of the Caribous, which it designated as the CV-2, by 1964. Needless to say, the Air Force considered the Army's plans an encroachment into its own areas of responsibility as established by law, and protested the move. But with an emphasis on counterinsurgency in the Kennedy Administration, the Army was able to get funding for the new airplanes. In late 1961 the United States began assisting South Vietnam in its efforts to combat the Communist guerrillas who soon came to be known as the Viet Cong. When the US decided to beef up the South Vietnamese airlift capabilities, the Army wanted to send helicopters and a company of CV-2s. USAF Chief of Staff Gen. Curtis Lemay protested the move and the USAF C-123 Provider was sent instead. But the Army continued manuevering to introduce the Caribou to Vietnam, and in mid-1962 suceeded in sending a company of the small airplanes to Southeast Asia under the pretense of using them to support Army installations in Thailand. But within weeks of their arrival in Thailand, the commander of the Military Assistance Command in Vietnam, an Army general, got permission to bring a few CV-2 to Vietnam "for test purposes." Once they got there, the Caribous never left. From 1962-1966 the Caribou was operated by US Army aviation companies from their base at Vung Tau. The Army used the CV-2s outside the Vietnam airlift system that controlled the USAF C-123s. In the eyes of the Air Force, the Army saw the Caribous in the same way as they saw jeeps and trucks, as transportation that should be controlled by the local commander. While the Caribous served a useful purpose in the support of remote camps with very short runways, they were often used by the Army for tasks that could have otherwise been more effectively performed by C-123s. The small payloads of the CV-2 required multiple shuttles to move men and equipment that could have been moved by a single C-123 or C-130. Still, the CV-2s performed certain tasks that were clearly beyond the capabilities of the C-123 as they operated into extremely short runways. There was an obvious need for such an airplane in Vietnam. In 1965 the Army organized the First Cavalry Division (Airmobile) at Fort Benning, Georgia when the 11th Air Assault Division was replaced. Caribous were attached to the cavalry division and deployed with it to Vietnam. Shortly after the arrival of the 1st Cav, the battle of the Ia Drang Valley clearly demonstrated both the shortcomings of the Caribou and the Army's dependence on the Air Force for the kind of airlift needed to support an airmobile unit in combat. The Cav's helicopters were thirsty for fuel and the tiny CV-2s were unable to meet the demand. While it took seven Caribou missions to deliver 14 500-gallon fuel bladders, a single C-130 could deliver the same load. The Army Caribou force proved inadequate for the task of supplying large units, and it was not long before the Army Chief of Staff suggested that the airplanes be transferred to the Air Force in return for an agreement to allow the Army to develop heavy-lift helicopter capabilities, a mission that the Air Force had already undertaken. The two Chiefs of Staff agreed and plans were made to transfer the CV-2 to the Air Force, where the airplane became the C-7A. By 1966 there were six US Army aviation companies equipped with Caribous in Vietnam, so the Air Force organized an equal number of squadrons as part of the newly activated 483rd Troop Carrier Wing. While the 483rd was to be based at Cam Rhan Bay, the squadrons were dispersed, with the 457th and 458th at Cam Rhan, the 535th and 536th at Vung Tau and the 459th and 537th at Phu Cat. An Air Force training unit was set up at Fort Benning where the Army trained its Caribou crews and USAF pilots and mechanics began replacing Army personnel in Vietnam. As soon as the transition was complete, the two schools moved to Sewart AFB, Tennessee. Veteran USAF airlift personnel were placed in leadership positions in the squadrons while the remainder of the pilots were older officers who were coming back to the cockpit from non-flying duties or from inactivating SAC bomber squadrons and young lieutenants fresh from pilot training in jets. No navigators were assigned to the crews, and the flight mechanic doubled as a loadmaster. After the transition to the Air Force, the C-7s fell under the common service airlift center in Saigon, which became the 834th Air Division in early fall of 1966. The C-7s were to be scheduled along with the C-130s and C-123s that were also controlled by 834th, with missions assigned according to the task involved. The shortfield landing capabilities of the C-7 made it ideal for missions supporting remote camps and units operating deep in the field away from runways capable of supporting C-123s or C-130s. Some airplanes were assigned directly to Army units, particularl the 1st Cavalry Division, for specific tasks in support of local objectives. Because of their limited payloads and slower speeds, the C-7s were usually not used in support of larger combat tasks except when the only runways available ruled their use. During the siege of Khe Sanh only eight C-7 missions were flown into the base, though Caribous airlifted troops of the Cav' into LZ Stud, an airstrip that was constructed specifically for C-7 use, for the relief mission, Operation PEGASUS. In addition to exceptionally short-field capabilities, the C-7 was extremely manuverable and very simply constructed, two qualities that made it ideal for airdrop operations into confined areas in the face of enemy fire. In August, 1968 the C-7s were called on to resupply the camp at Duc Lap when it came under attack by North Vietnamese troops. The first mission was flown by Captain David Rogers, an experienced pilot who was on his last day of flying in Vietnam. Captain Rogers and his crew made two flights to Duc Lap, and dropped their loads successfully in spite of intense ground fire. He flew through heavy tracers and made several evasive manuevers, then dropped to 300 feet for the drop. When At Ban Me Thout Rogers took on another load even though his airplane had been damaged by ground fire. The crew made another drop, after again encountering heavy ground fire. Another crew made another drop later in the day. That evening Major George Finck made a night drop. The following day Major Hunter Hackney flew two missions to Duc Lap. On the first flight Hackney's C-7 took "hundreds" of hits but the bundles fell into the compound. Hackney's crew switched to another airplane at Ban Me Thout and flew a second mission where they encountered the same heavy fire and suffered major battle damage, but survived. Hackney and Finck were awarded the Air Force Cross. In early 1969 the Caribou crews found themselves in a similar situation when the North Vietnamese attacked Ben Het, a camp in the mountains northwest of Plieku. In late February intense enemy shelling led to a series of C-7 drops, while a C-130 crew commanded by Major Curtiss Messex made the first night C-130 drop of the war. In mid-May the NVA succeeded in cutting the road to Ben Het from Dak To, and the camp became totally dependent upon airlift for resupply. At first the C-7s landed on the strip by the camp but on June 1 landings were halted due to shelling and bad weather. Two days later the C-7 crews started dropping supplies to the camp. Enemy fire continued increasing and by the middle of June the drop zone had to be moved inside the camp itself. This ruled out the use of larger transports such as C-123s or C-130s, because the confined area called for pinpoint accuracy with small bundles. Air strikes were scheduled in advance of each drop but no effort was made at first to coordinate the fighters with the transports. A new tactic was developed which called for fighters to concentrate their attacks during a specified period while C-7 flights of up to six airplanes made successive passes on the drop zone to deliver the bundles. A-1Es would lay down smoke in preparation for the drops, then make strafing passes alongside the C-7s during the drops. The new procedure worked, and enemy hits were reduced to nothing after the new tactics went into effect. A year later the Communists attacked Dak Seang, which lay just north of Ben Het. In spite of indications that the enemy was building up strength in the area, no preparations were made. Only 12 hours before the attack was launched on April 1, Caribous were landing at Dak Seang to pick up ammunition for transport to another camp where the threat was thought to be greater. When the enemy made their presence known, it became clear that they had taken a lesson from Ben Het as numerous antiaircraft guns revealed their presence in the areas that were the most likely air resupply corridors. During the afternoon of April 1, C-7 crews made the first drops into the camp. Enemy fire was light during the drop, but increased as the crews left the area. One airplane took two hits. The next morning the first C-7 over the camp reported ground fire while making a right hand turn after his drop. The second airplane turned left, and was hit by heavy fire. It crashed five miles from the camp; there were no survivors. That afternoon an all-out effort was made to supply the camp. Eleven C-7s dropped to the camp while using tactics learned at Ben Het as they used descending turns to approach the camp at 20-second intervals. Three airplanes were hit by ground fire. Over the next two days the C-7s made 31 drops using the same tactics. Fourteen airplanes were hit, and one was forced to land at nearby Dak To. For more than a week the C-7 crews continued the effort, with airplanes taking hits on each mission. On April 4 a second Caribou was shot down. A third fell two days later. Though supplies were getting into the camp, some were lost while the C-7s were paying a heavy toll. In an attempt to reduce the losses, the C-7s turned to night drops under the light flares dropped by AC-119 gunships who would also provide fire suppression. The new tactics worked as the C-7s took less hits and most of the bundles landed within the camp. Santabous delivered loads of Christmas goodies to the Special Forces camps for the Montagnards. Beginning in 1970, the Air Force started deactivating the C-7 squadrons. The deactivations continued through 1971 and by the spring of 1972 all American C-7 activities in South Vietnam had ceased. The airplanes were returned to the United States for overhaul and assignment to Air Force Reserve units. Some airplanes were given to the Vietnamese. The Royal Australian Air Force also operated Caribous in Vietnam, though their name for the Canadian-built airplane was "Wallabie," another name for kangaroo. Six RAAF Wallabies deployed to South Vietnam in August, 1964 and were based at Vung Tau. 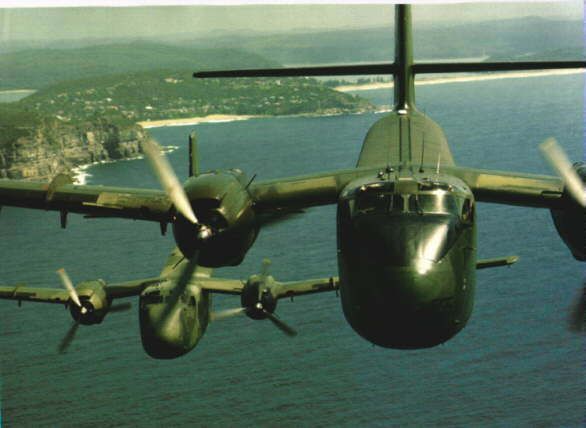 Unlike the Army CV-2s who were at Vung Tau at the time, the RAAF Wallabies operated within the common service airlift system doing short field work. One USAF C-123 squadron commander reported that a single RAAF Wallabie crew could do the work of two of US Army crews. The Australian airplanes were termed as "the best maintained airplanes in Vietnam." Even though Australian ground troops arrived in South Vietnam in 1965, the RAAF Wallibies continued to operate under the control of the common service airlift system. In June, 1971 the RAAF force was reduced to four airplanes and it withdrew completely from Vietnam in February, 1972. The South Vietnamese began operating Caribous in 1971 as the American C-7 squadrons deactivated. At first the Vietnamese flew with the American squadrons; the first VNAF C-7 squadron activated on March 1, 1970. A few C-7s served with the VNAF until the final Communist victory. AIR AMERICA also operated a few Caribous, mostly in support of operations in Laos. Pacific Architects and Engineers, an American construction company doing business for the military in Vietnam, operated two Caribous for the use of its teams working throughout Southeast Asia. Though most Caribous transferred to the Air Force, the Army retained a handful for liasion tasks. Click AIRLIFT HISTORY to return.